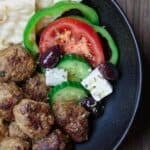 Easy Greek meatballs recipe, also known as Keftedes! Flavor-packed tender meatballs with a crispy crust and a lemony sauce. This recipe can serve a crowd as an appetizer, but see our serving suggestions for a Greek-style dinner bowl! Keftedes, Kofte, or Kofta. 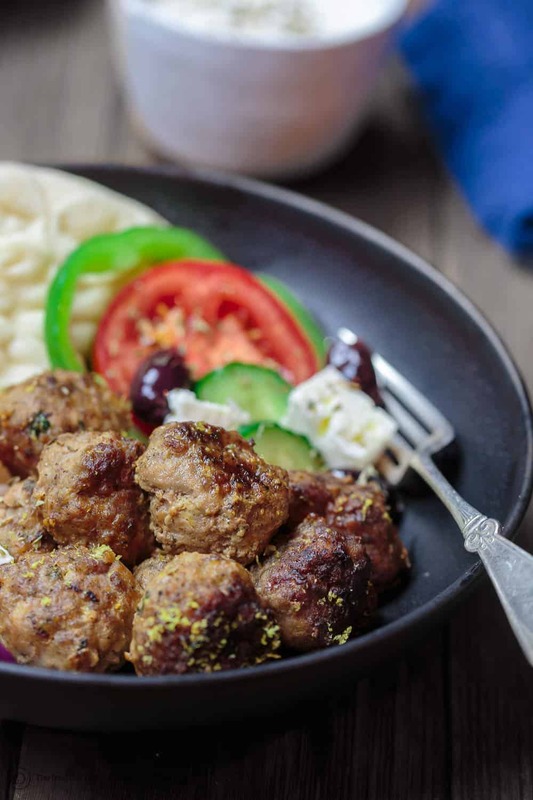 Whatever the name, they all represent exquisite Eastern Mediterranean variations on meatballs. A mixture of ground meat infused with spices and flavors of whatever region they come from. Formed into patties then baked as in this Turkish version. Grilled, kabob-style. 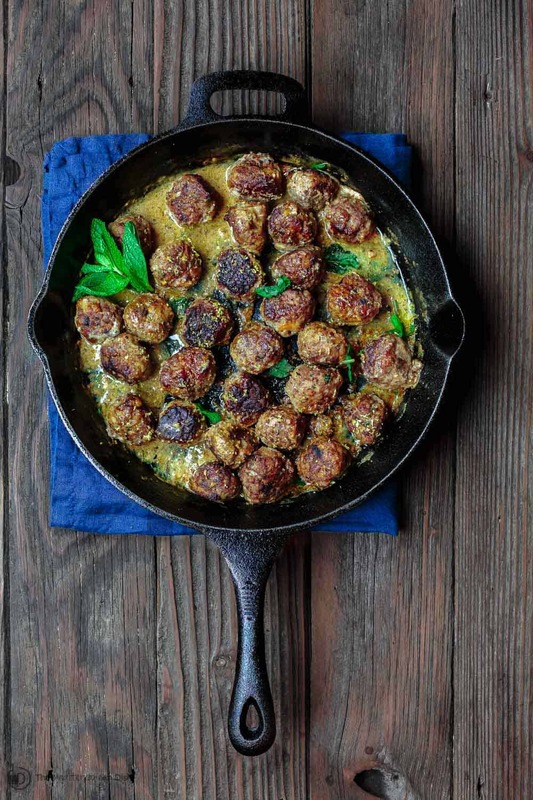 Or pan-fried in extra virgin olive oil–then finished in a lemony sauce–as in today’s Greek meatballs. This recipe is a very lose interpretation of Yiayia Helen’s Greek meatballs. Helen and I met at a local Greek festival last year. A feisty grandma with a binder full of Greek recipes. Pages worn out and stained with olive oil. She had no problem sharing about her famous Greek meatballs. “I make for a minimum of 50 people at a time,” she announced as she pointed to the recipe. Her keftedes meat mixture is flavored with fresh mint and spices like coriander, cumin, nutmeg and oregano. Yiayia Helen insisted on using Greek oregano, of course. Every cook seems to have their own technique for creating the juiciest meatballs. Helen’s trick? Add a bread-based paste (or mush) made by soaking day-old bread or pita into milk. You wring out the excess milk, then add the resulting piece of mushy bread into the keftedes mixture. This prevents bits of meat from binding to each other, keeping the patties tender. And to achieve a crispy crust, it’s best to pan-fry the Greek meatballs in olive oil before adding the sauce. Some versions of Greek keftedes call for red sauce, but I prefer this version with a lemony broth that’s been thickened with egg yolk. This keftedes recipe makes about 32 meatballs. If you have a large crowd, you can simply serve load them up on a platter as an appetizer. 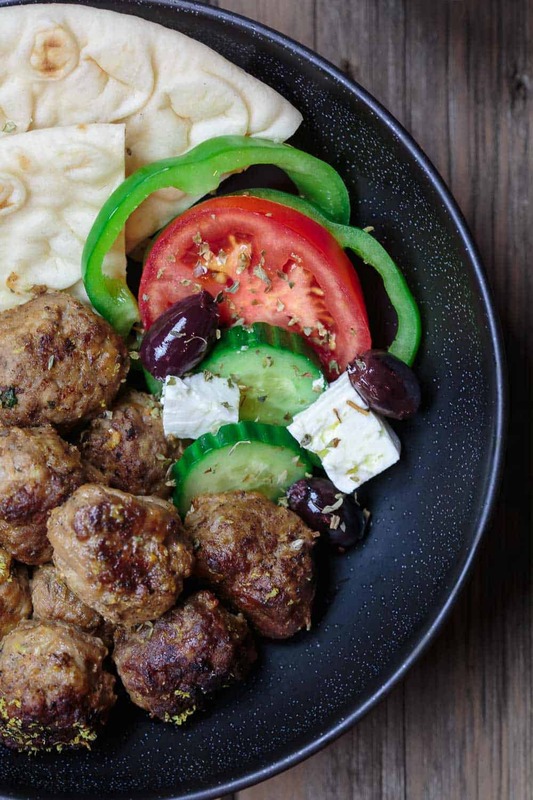 But for dinner, I like to serve a few Greek meatballs in a bowl with pita bread, Greek salad, and Tzatziki sauce for dipping. Of course, you can simply make pita pocket sandwiches too. 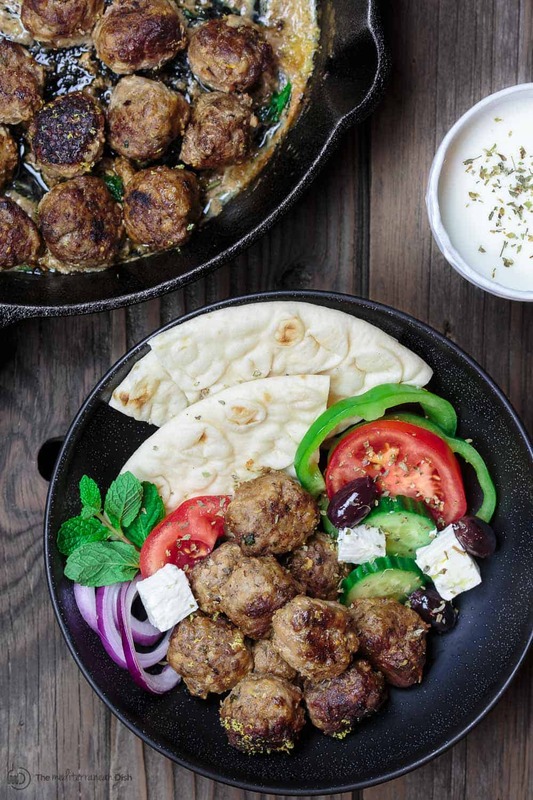 All-star keftedes Greek meatballs recipe. Tender on the inside, crispy on the outside. Flavor-packed with fresh mint, spices and a lemony Greek sauce! If serving in bowls as suggested in this post, first prepare the Greek salad according to this recipe (dress salad later, if you prefer) and Tzatziki sauce according to this recipe. Set aside or refrigerate for now. In a large skillet like this one, heat 2 tbsp Private Reserve olive oil over medium heat. Add onions and garlic and cook until golden and translucent, stirring regularly. Transfer the onions and garlic mixture to a large mixing bowl to cool. Set skillet aside for later. To the mixing bowl add the ground beef and lamb (or pork), 1 egg, fresh mint, spices, salt and pepper, and 1 tbsp lemon zest. Mix by hand until until mixture is fully incorporated. Form the meat mixture into balls (each the size of a heaping tablespoon.) Roll meatballs into the flour to lightly coat and place them on a large tray for now. In the large skillet you used earlier, add 1/4 cup Private Reserve olive oil. Heat over medium-high. Turn heat to medium and add the meatballs to cook (do this in batches if you need to.) Cook meatballs for 10 minutes or so, turning occasionally, until fully cooked and well-crusted on all sides. With a slotted spoon, remove meatballs from skillet onto paper towels to drain any excess fat. Meanwhile, carefully discard most of the cooking fat from skillet (best to dump into a tin can until cooled). Return skillet to stove-top over medium heat. Whisk the 1 egg yolk with the chicken broth and lemon juice. Add to cooking skillet with the remaining lemon zest, then add the meatballs back in. Cook over medium heat for another 5 minutes until the lemon sauce thickens. Serve hot in bowls with pita bread, Greek salad and Tzatziki sauce. Or serve in pita pockets as sandwiches, if you prefer. Recommended for This Recipe Our Private Reserve Greek Extra Virgin Olive Oil (from organically grown and processed Koroneiki olives!) And all-natural and organic ground coriander, ground cumin, and ground nutmeg. SAVE! Try our Ultimate Mediterranean Spice Bundle or create your own 6-Pack or 3-Pack of our all-natural or organic spices! Made these last week, wow so yummie tasty! With greek salad and Tzatziki. As I didn´t fry the onions and garlic on beforehand, just mixed them in raw, it kept the Keftedes moist enough, even using normal dry bread crumb, as I do in Polpette and Japanese meatballs, too. Also, the minced pork helped keeping them soft, containing a little more fat than the beef. In my Polpette recipe, I add crumbled Ricotta cheese, which also helps to keep them soft and tender. I´ll try this in my Keftedes next time, see how it results. Might work with Feta, too. Just made these for a brunch yesterday! They were so yummy! They were a great addition to a Mediterranean spread! I also made the artichoke egg dish! Lovely brunch meal! I want to make these for a friend to take them over to her family for their dinner along with a salad. My question is do you leave the meatballs in the broth, or keep them separate until they heat them up that evening. She just lost her mother and I wanted to make something tasty but easy for her to get ready. My kids (aged 4 and 8) LOVED these meatballs! I used very lean ground turkey and I think the milk-soaked bread was the key to keeping them super moist. I also baked them in the oven (18 min @350 degrees) instead of frying them. I still made the lemony sauce and it was a hit as well! Awesome, Colleen! Love this variation. Yes, the milk-soaked bread is key!